Last Word Constantia in Cape Town is ideally located near wine estates, beaches, award-wining restaurants and many Cape Town attractions. The suburb of Constantia is well-known for its fine restaurants so while breakfast can be enjoyed on the property, guests can choose from a large variety of internationally recognised restaurants in the area. Alternatively, guests can arrange a chef to prepare a traditional South African meal to be enjoyed in the private dining area. This Constantia hotel in Cape Town will ensure guests get to experience the many sites in the area, and will even provide transport to them. There are some of the country’s top wine estates in the proximity of the hotel. Guests can also choose to do some shopping or dine at the restaurants at the Constantia Mall or further afield at the V and A Waterfront. Guests also don’t have to travel too far to access some of the Cape’s top attractions like the Simonstown and False Bay beaches or even the city centre. There are a number of championship golf courses close by as well. This Constantia hotel in Cape Town can also assist with day tours. 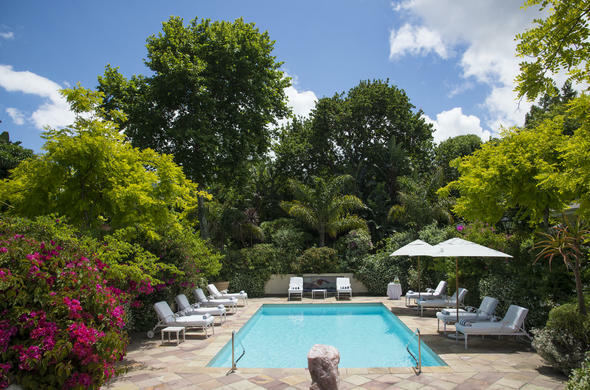 The Constantia Hotel prides itself on offering guests peace and tranquility. Guests can spend a relaxing day at the sunken swimming pool fitted with a surrounding tanning desk. The pool is located in a manicured garden with rolling lawns, vibrant colours and magnificent mountain views. A floodlit tennis court is also available to guests.